Honda is broadening their horizon with the addition of another hybrid vehicle. This time the Accord gets the assistance of an electric motor, and with Honda’s renown efficiency the new Honda Accord Sport Hybrid is set to keep your travelling costs low. 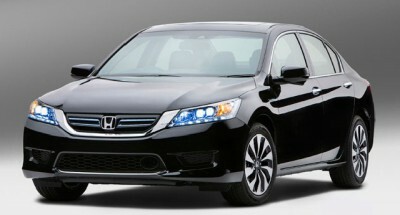 Similar in appearance to the other Accord models, the Accord Hybrid Sport has a well-proportioned and streamlined body. Look closely and you’ll see that the Accord Sport Hybrid has blue accents to highlight the tail lights and headlights – just to set this model apart. To drive, the Accord Sport Hybrid has a nice flow about the way it drives. There is always plenty of grip for an enthusiastic drive, and the smooth operation of the engine and CVT gearbox makes for a relaxed and satisfying driving experience. You’ll notice that the Accord Hybrid Sport has three modes in which it drives. Honda’s Intelligent Multi-Mode Drive system helps to make the drive as efficient as possible, and hence the three modes are: Electric Vehicle Drive (EV), Hybrid Vehicle Drive (HV) and Engine Drive. EV is for low to moderate speeds or when stopped, and runs on a sufficiently charged battery. The electric motor provides the power to the wheels. HV is the mode the Accord Sport Hybrid uses for strong acceleration and high speed cruising. In this mode, the electric motor provides the power to the wheels, and the petrol engine drives the generator to charge the battery. In Engine Drive mode, the petrol engine provides power to the wheels, it recharges the battery and occurs in high speed cruising. What you experience behind the wheel is a smooth and unnoticeable transition between modes. One of the things to get used to is the way the car engine stops completely at traffic lights. As soon as you prod the accelerator, the car wakes up instantly and accelerates away. One of the other facets about driving a hybrid car is that they are very quiet around town. Try one, and see for yourself. Combined electric motor and petrol engine power output is a very sprightly 146 kW. This is linked to Honda’s silky Electronic Continuously Variable Transmission (E-CVT). You have the goods for a fast smooth drive whatever the road, and the 2.0 litre DOHC i-VTEC engine always seems to have enough grunt in all situations, as the 307 Nm of torque is very capable. You can expect a 0-100 km/h dash less than 8.0 seconds – making it the quickest in its class. Honda remains at the forefront of efficiency with the new Honda Accord Sport Hybrid, and again with a combined fuel consumption figure of 4.6 litres/100 km this is a class leader. If you are concerned about the car’s effect on the environment, just check out the low 107g/km of CO2 emissions. The whole range of new Honda Accords boast the full array of safety equipment, and thus make them one of the safest medium/large cars on the road. An Advanced Driver Assist System (ADAS), Lane Watch system and a multi-angle reversing camera come as standard features on the Honda Accord Sport Hybrid. The all-new Acoustic Vehicle Alerting System (AVAS) is designed to audibly warn pedestrians when the car is approaching in EV Drive mode. This is a handy feature, particularly in busy city streets. Of course, all the safety stuff you take for granted in a new car is all there; things like antilock disc brakes, stability and traction control, active front head restraints, front seat side airbags, side curtain airbags and a rearview camera is standard. Lane-departure and forward-collision warning systems make this is a very comprehensively safe motorcar. Always a nice vehicle to travel in, the Honda Accord Sport Hybrid has a base level of equipment on which you can build the odd accessory on. In other words this is a very well equipped model. The level of equipment includes: a nice standard set of alloy wheels, heated side mirrors, dual-zone automatic climate control, an eight-inch video display, automatic headlights, adaptive cruise control, Bluetooth phone and audio connectivity, keyless ignition and entry, a rearview camera, Honda’s LaneWatch blind-spot display, an eight-way power driver seat (with power lumbar support) and a premium audio system with a CD player. Leather upholstery, a sunroof, forward-collision and lane-departure warning systems, an auto-dimming rearview mirror, driver memory settings, heated front seats, satellite radio and smartphone, LED headlights and a navigation system with voice recognition is definitely pretty cool techie gear which I reckon makes this one of the nicest, most sensible and realistic hybrids that you can buy for your money. It will carry five adults in comfort. For any more information on the Honda Accord Hybrid Sport, or for that matter any other new car, contact one of our friendly consultants on 1300 303 181. If you’d like some fleet discount pricing (yes even for private buyers! ), we can submit vehicle quote requests out to our national network of Honda dealers and come back with pricing within 24 hours. Private Fleet – car buying made easy!